Waste not want not. 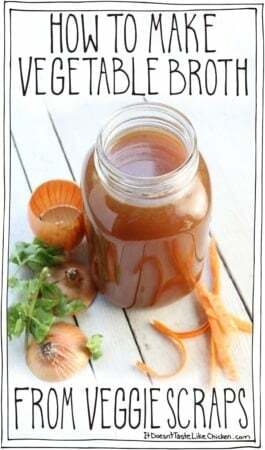 This easy DIY recipe uses up all those leftover veggie scraps to make a homemade broth. Heat the olive oil in a large pot over medium-high heat. Add in the onion and garlic and sauté for around 5 minutes until it begins to brown. Add in all the veggie scraps, water, bay leaves, peppercorns, and salt. Bring to a simmer and cook for about 45 minutes until they broth is fragrant and rich in colour. The broth will vary in colour and taste depending on the scraps used. Put a fine colander over a large bowl or another large pot. Strain out the veggie scraps and discard. Use your broth right away or store it for later. It freezes very well. *Depending on the veggies you use, your broth may vary in potency. Feel free to add more water to thin it out, or to cook the broth down to make it more intensely flavoured if needed.